Find out which tracts have what values ... click the %HS Grad (or %Coll Grad) twice in the ranking table provided below. The educational attainment measures are among thousands of subject matter items now available for all U.S. census tracts, states, counties, cities, school districts and other geographies based on the American Community Survey 2009 5-year estimates released December 2010. These are the first "richer demographics" for all census tracts since Census 2000. Use the interactive ranking table below to rank/compare/examine selected measures for all Utah census tracts. See related national scope state/county and cities/places ranking tables; use links in left panel. See the scope of an additional approximate 600 subject matter items available in the 4-part demographic profile (see descriptions: demographic, social, economic, housing). These data are available organized as datasets ready to use for spreadsheet applications, mapping and GIS analysis and integration with other data. Contact us (mention tract demographic estimates in text section or call 888-364-7656) for additional information. To view a map of a tract of interest, click the TractCode link in the table. To locate a tract of interest based on a ZIP code or address, find census tract code and then locate that tract code in the table. More about tract geography and codes.  Table includes all State census tracts with boundaries defined as of Census 2000. The national scope uniquely identifying tract geocode is the 11 character code shown in column 4 in the ranking table. This is the recommended tract unique identifier, as opposed to the tract code shown in column 3 (often used in map depictions). The tract geocode is of the form SSCCCTTTTTT where SS is the FIPS state code, CCC is the county FIPS code and TTTTTT is the Census assigned tract code. 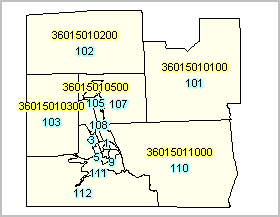 In the tract-only portion of the geocode, there are never blanks or dots and lead zeroes are used for each the state, county and tract code components. As this question sometimes arises, the Census Bureau assigned a default census tract code of 000000 to some coastal and Great Lakes water and territorial sea, rather than extend the census tract boundary into the Great Lakes or to the three-mile limit. The graphic at right shows Chemung County, NY by census tract. Click the map for larger view then press F11 key. 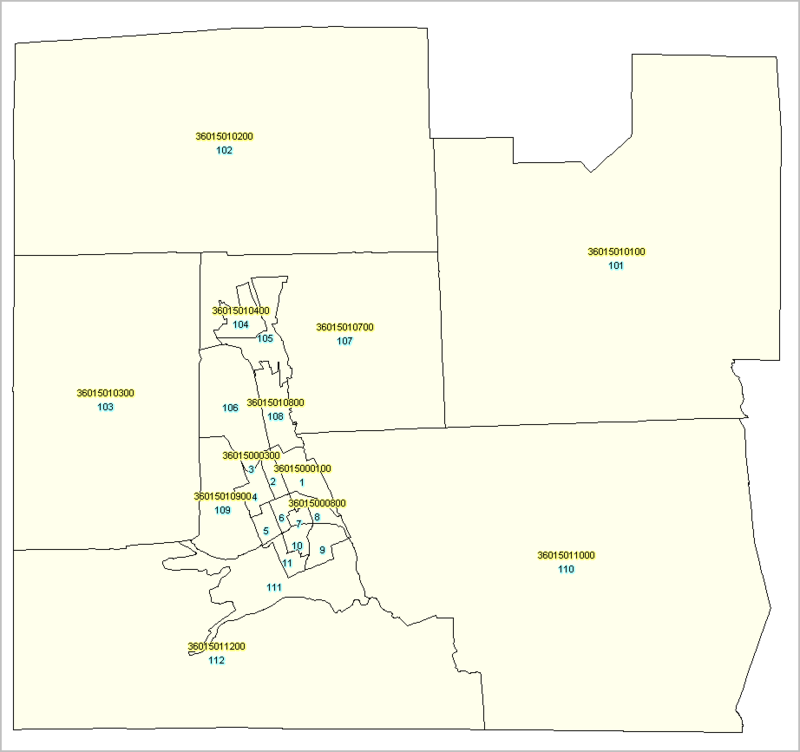 The map shows tracts comprising the county with blue and yellow labels. The label display option was set to no overlap so not all tract codes appear. Blue tract codes correspond to codes shown in column 3 in the ranking table. Yellow tract codes correspond to codes shown in column 4 in the ranking table. For map display and reference purposes, it is easy to see why the shorter, tract only, code is preferred.